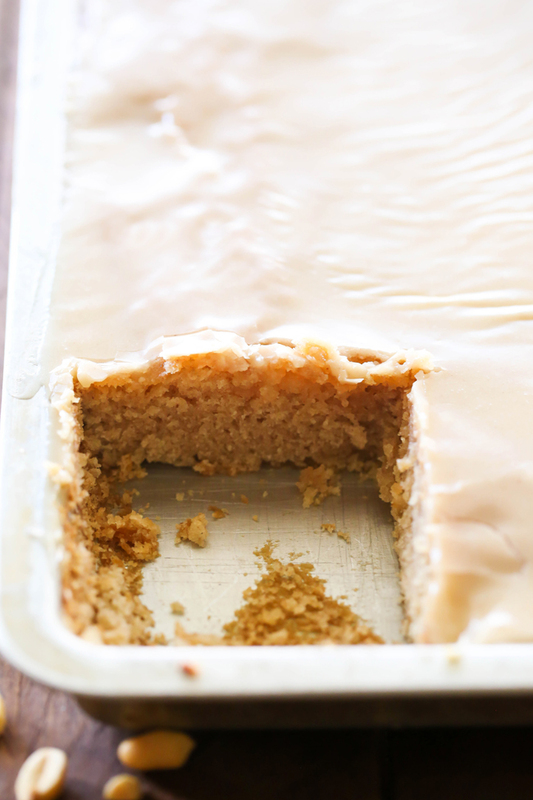 If you love peanut butter, then you absolutely need to try this MELT-IN-YOUR-MOUTH Peanut Butter Sheet Cake. It is truly amazing! Do you love peanut Butter? Who am I kidding, most of the world loves it! This cake is a new version of the Chocolate Sheet Cake on the blog. It is moist, easy and has peanut butter frosting swirled throughout. Each bite is a peanut butter lover’s dream come true! Another great thing about this cake is that it could feed a large group of people. It is wonderful for company and is sure to get rave reviews! Spray a 15x10x1 inch baking sheet. Combine flour and sugar in mixing bowl and set aside. In a large microwavable mixing bowl combine butter, shortening, and water. Cook for about 3½ minutes until butter and shortening are melted. Stir in peanut butter and return to microwave for 40 seconds. Stir until smooth. Add flour and sugar mixture to the hot liquid and stir well. Add buttermilk then baking soda, then eggs, and then vanilla, stirring after each addition. Pour into baking dish and bake at 400 degrees F for 20-25 minutes or until a toothpick comes out clean. Poke cake all over with fork to allow places for the frosting to ooze down into. In a small microwavable mixing bowl, combine butter and milk and heat until butter is melted. Add peanut butter and return to the microwave for 30 second. Add powder sugar and vanilla and mix well. If you don't have vegetable shortening can you substitute vegetable oil since you're melting it anyway? I followed the recpie to the letter, the batter was very runny and after 25mins it was nowhere near cooked I ended up having to leave it in for 60mins before the toothpick came out clean. Im wondering if I used more flour? maybe three cups instead of 2 might this help the issues I have had? Update: once cake was cooled and iced the cake had sunk, when I cut into it and it was dense, it almost looked uncooked?, such a shame. Wish I could post a picture. Had to bin it!? Reading the recpie again, maybe i should reduce the amount of water? My Mom made the best peanut butter cupcakes with the best peanut butter frosting. She died in 1973 and no one in my family has the recipe, so I'm hoping that this is the one that tastes like hers. There is one more thing that she baked for us, that I don't have a recipe for, is her Thumbprint Cookies. I was 8 years old when she died, and I will turn 51 years old next month, but when you spend a lot of time in the kitchen, while your mom is cooking, you remember a lot of things and these are the memories that you have for the rest of your life! Turned out great. Halved and put into square glass 8x8 used underfilled cups of whole wheat flour. Used vanilla bean and some almond in the frosting. Topped with dried blueberries :) cooked at 350 for around 25 min. I love this cake. A co-worker made it but, would not share the recipe. Thank you for posting this keeper. Love this! Came out beautiful. Used palm shortening on mine. Only took 25 minutes. Made it for my grandkids. 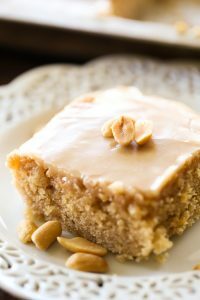 Can you substitute butter for vegetable shortening in peanut butter cake? I'm wondering if I can use a 9x13 pan and what adjustment to make on the bake time.. This is seriously the best cake I've ever made/eaten. Peanut butter is my #3's favourite food so it made a ridiculously tasty and easy birthday cake! Thank you so much!